This is the teen that has the fashion world teeter-tottering on its edge (and me interested in blogging and fashion in the first place). 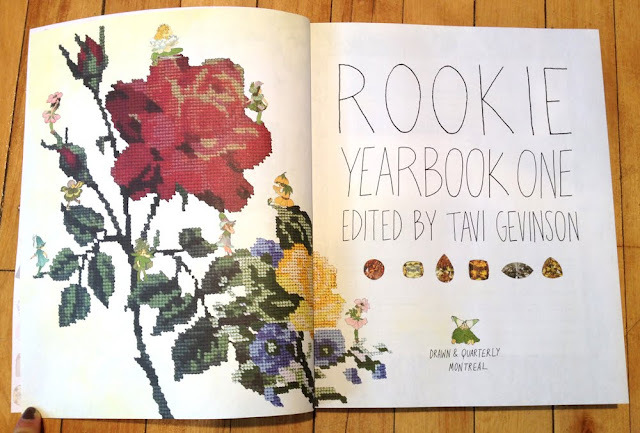 Tavi Gevinson is a trail-blazer, having started her blog in March of 2008 (when I was graduating from 5th grade) and is now the founder and editor of her own magazine- RookieMag when she was 15. She is a boss...to put it lightly...and she's only just turned sixteen! 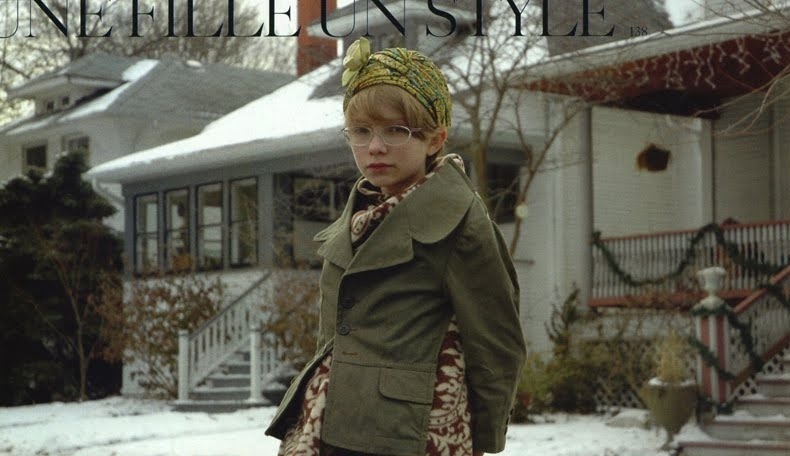 Tavi Gevinson created the phenomenal blog Style Rookie, which she founded on March 31st 2008, at 11 years old. At first, the fashion world suspected Tavi Gevinson's blog of being fake, due its professional nature, magazine analysis, style recreations and high level of content. Since then Tavi Gevinson has become a sensation within the fashion industry, spending time at New York Fashion Week, as cover girl for Pop magazine and wearing custom made clothing by Rodarte. Tavi Gevinson was first contacted by the Rodarte sisters, Kate and Laura Mulleavy, who read her blog and "immediately emailed her". The Rodarte sisters then sent Tavi Gevinson a pair of hand-knit tights from their Fall 2008 show. Rodarte were quoted as saying that Tavi Gevinson "defines the Rodarte for Target collection. Tavi Gevinson blogged and reported for Rodarte during their Fall 2008 show. Tavi then attended Tokyo Fashion Week as the guest of honour at Commes des Garçonsshow. Gevinson also attended the Museum of Contemporary Art's 25th gala in LA, she wore a borrowed Rodarte dress and sweater that were apparently so expensive as to be out of reach to the designer's usual customers. Tavi also featured in Katie Grand's Love magazine, in an interview by Pixie Geldof. Tavi Gevinson attended New York Fashion Week in September 2009, as a fashion correspondent for Dasha Zhukova's POP magazine. Tavi was chaperoned during fashion week by her father. While at New York Fashion Week, Tavi attended Marc Jacobs, Alexander Wang and Y-3. Tavi Gevinson notoriously attended Paris Fashion Week and received negativity due to wearing a large bow while seated in the front row of the Christian Dior couture show.The bow designed by Stephen Jones caused some discomfort for editor of Graziamagazine and Jeanne Beker, who were displeased to have watched the couture show through the bow. This was not the first time that Tavi Gevinson has received criticism, editor of Elle magazine Anne Slowey has questioned the authenticity of her blog and whether or not she is responsible for its content. Tavi Gevinson's blog has attracted approximately four million readers as of September 2009, with over 1.5 million monthly readers.Tavi Gevinson's parents were not aware of her blog, The Style Rookie until Gevinson asked for permission to appear in an article for the New York Times magazine. Tavi's father, Steve Gevinson, an english teacher, replied that he "may have known, but to me it was a kind of a non-thing to know".Tavi's mother is an artist. Tavi Gevinson has recently collaborated on a new project, a zine called First Kiss, a collection of first kiss stories. London based Borders and Frontiers partnered with Tavi to design and sell her own t-shirt. Tavi Gevinson's blog was blocked by blogger on April 26th 2010. The site displayed a message "This blog is under review due to possible Blogger Terms of Service violations and is open to authors only." Tavi Gevinson was first unaware of the reason for the blogger violation. She later confirmed via her twitter account, that a photo she had posted of Yohji Yammamoto. Tavi Gevinson will speak at Generation Next Forum discussing the unpredictability of Generation Y.
Gevinson was born in Chicago, the daughter of Berit Engen, who was originally from Oslo, Norway, and Steve Gevinson, a retired English teacher. Gevinson started blogging on March 31, 2008 at age eleven. She named her blog "Style Rookie". Her parents did not appreciate what Tavi was doing until she asked for their permission to appear in a New York Times magazine story. This Tavi, decked out in awesome sequined shorts and a cool Peter Pan-ish top (very Tavi-like) and looking quite demure...adorable? I think so. She's rocking the whole printed jean thing and just look at all those designs...hail the tiny people of the blogging world! She looks so cute and grandma-like...it's unbelievable! I am jelling...because they are at a fashion show in cute outfits, and I'm not there. She is my inspiration to keep blogging guys...she's so awesome, yet so grounded and cool that it's not even believable. She has stories written about her in major mags everywhere...she's....awesome! ...find Rookie, love it, read it, pitch ideas, whatever. topic? I'd be very grateful if you could elaborate a little bit further. Appreciate it!